Are you looking for an exciting adventure in a new country, or simply want to a new department in France? Then this stunningly presented House For Sale In South West France may be just what you have been searching for! Built circa 1831, the spacious, well presented, Gascon property comprises of 3 very spacious double bedrooms (one with Velux windows), 2 bathrooms, 2 large reception rooms, large open plan country style kitchen and dining room, larder area with possibility of another bedroom, an extensive library/hobby room and storage area and a large walk in hallway. A wooden staircase adds authenticity to this 19th century house for sale in South West France. This property is positively packed with fantastic features, such as exposed beams and with such impressive specifications there has to be something for everyone. Located in the highly sought after Haute Pyrenees region, this magnificent house is within easy reach of many amenities while maintaining a feeling of rural France. Grounds extend over 6660 sq.m compromising of a large terrace, lawns to the front, side and rear, vegetable plots, trees and a water well in very good condition. 4 x Oak, Double Glazed, arched windows add to the authenticity of the property. 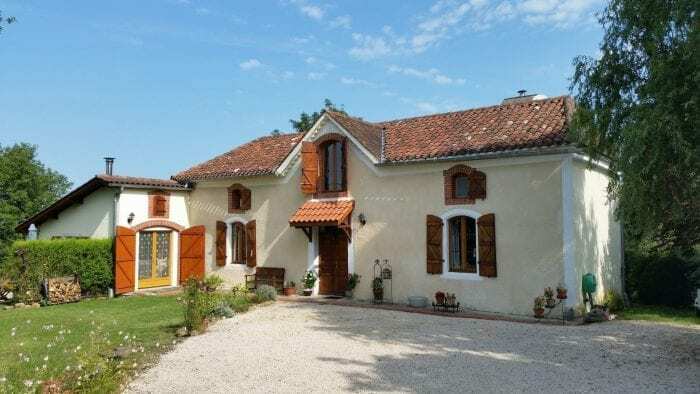 If you would like further details and price information regarding this house for sale in South West France, then please email either myself – sim@simslife.co.uk or wolseybear@gmail.com with the subject: House For Sale In South West France via Sim’s Life. oh wow, this looks beautiful! What a beautiful property. I love the grounds – stunning! I would love to live there, it looks idylic!